Similar to what the Republican House members did last year asking for public input with America Speaking Out, the White House allows you to submit a petition on any issue. However, you'll notice from the way it's phrased, just because a petition gets enough support doesn't mean it's going to be acted upon. It has to be reviewed first. The right to petition your government is guaranteed by the First Amendment of the United States Constitution. We the People provides a new way to petition the Obama Administration to take action on a range of important issues facing our country. We created We the People because we want to hear from you. If a petition gets enough support, White House staff will review it, ensure it’s sent to the appropriate policy experts, and issue an official response. As of this post, there are 55 petitions. 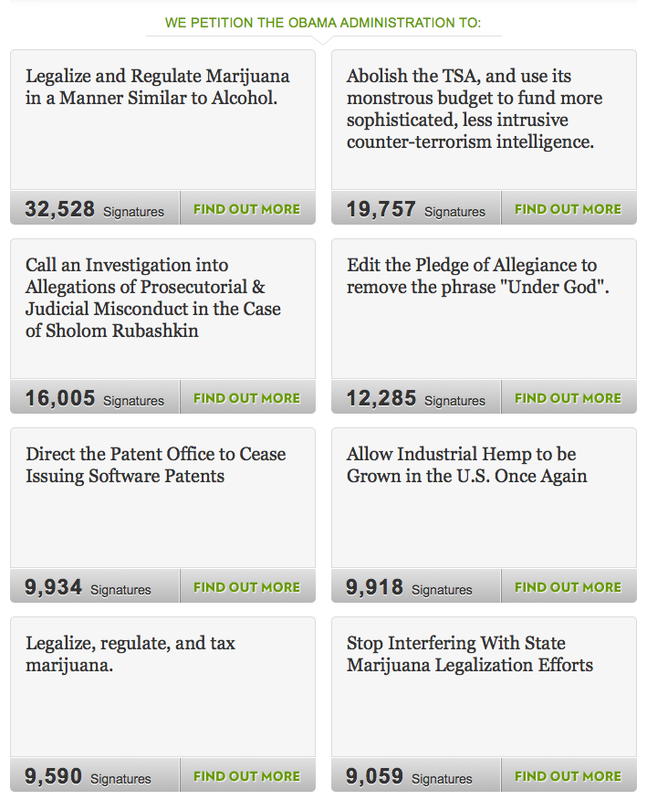 Here's a screenshot of the petitions with the most support. 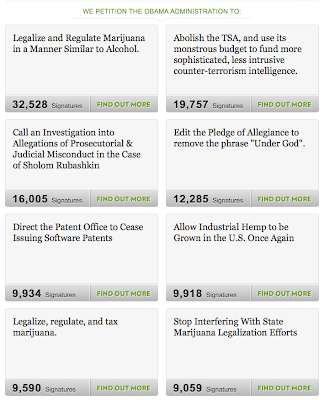 Half of the top eight petitions relate to federal marijuana laws. I remember marijuana reform was the top vote getting topic in one category on America Speaking Out until it was overtaken by the recommendation that Republicans act more liberal and democratic. I think it'll be a long time if either one happens.